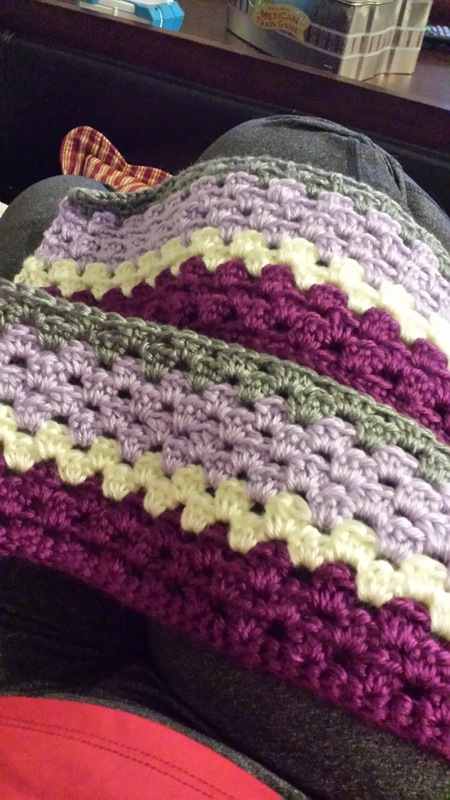 So I have a number of crochet projects that I’ve started in the last few months but haven’t shared. 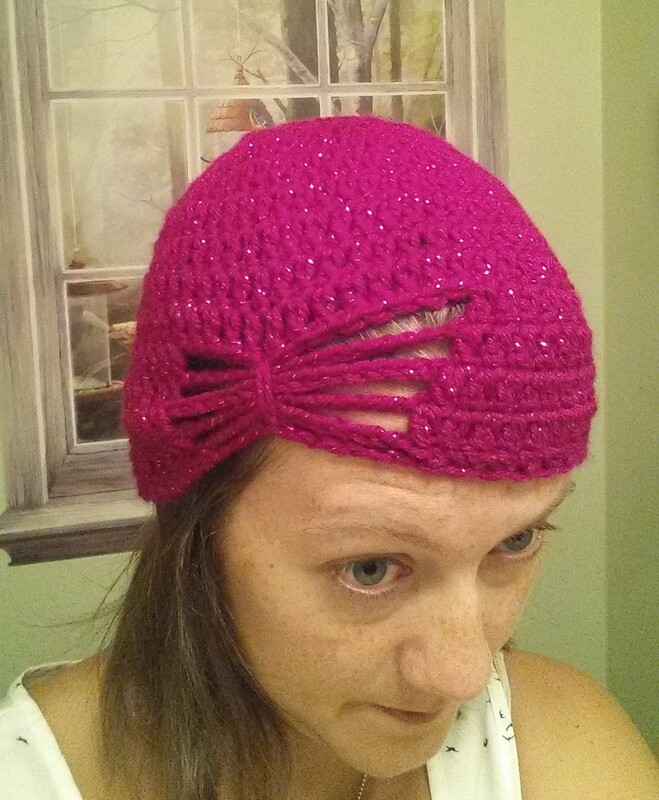 The latest two have been hats for a very special diva who’s starting chemo in Sept for a recurrence of a brain tumor. She’s going to be bald through the winter so she’s needs lots of hats to keep her head warm and as a 9 year old they need to be uber stylish!! 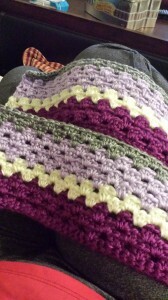 The other things I have started but not finished are a granny stripe blanket for us here at home. It was unintentional but I ended up picking the colors from my alma mater, good ole MUC (I still can’t bring myself to use UMU). 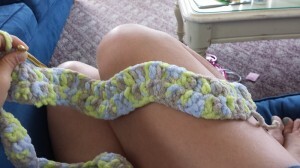 A ripple baby blanket that I’ve decided will go to the church for the prayer blankets project – it’s lap sized. And a random blanket that I was using to test stitches – it’s a pretty gold color that I finally found more yarn to match so I can make more progress. If nothing else it’s a great texture blanket for photography. I don’t have a picture of it though. 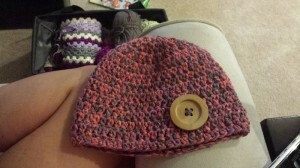 The kids have also asked for hats (once they saw the ones I was doing for Bella) so that’s on my list too. Plus, I have the yarn purchased/stored for two more blankets at least. So, as predicted, last week was pretty much a total FAIL in following the menu. I figured it might be with what was going on. So, there are some repeats this week because I really wanted to try them but didn’t get around to it last week. This week should be better and I’m committed to getting back on the clean eating wagon – I’m all kinds of sluggish because I’ve been lax about what I’m eating. The theme of this vacation was “seize the moment”. With a bit of unpredictable weather on the docket (it was supposed to rain every day we were down there), we took every non-rainy moment to get out and do things. We even took a few rainy moments to play on the beach (we were getting wet anyways). In the end, we had amazing weather a vast majority of the week. The skys were a bit overcast but the humidity was low and the air temps were moderate so it was very comfortable. We took the hottest day of the week and drove down to Nag’s Head figuring a few hours in the car would allow us to avoid some of the heat. It worked. We had a great day stopping at Jockey’s ridge for a bit and then continuing on to Nag’s Head. These pics are from one evening down at the beach. DH and I took the kids for a walk to find shells and I dragged the big camera along. I’m so glad I did! I have a bunch of pics from the rest of the days but need to finish working on them but right now I’m working on two crocheted hats for a very special little girl!! :) I’ll share those in a bit. Also, it appears that this week’s menu is not low carb because I’ve planned pasta twice in one week. Oh well, sometimes you win, sometimes you lose. The rest of the week is better. BBM 90 Day Challenge – COMPLETED! To catch everyone up – 90 (well…101 as of this writing) days ago, I started the Bikini Body Mommy challenge with a few girlfriends. The workouts were 20 min, 6 days a week and alternated between HIIT Cardio and Strength Training. The premise was that you pushed yourself hard for those 20 min and gave it everything you had and while the calorie burn was not huge, over the week it adds up. Combine it with clean/smart eating and you have a recipe for weight loss and improved health! I’m so proud to say that I made it through the entire 90 days without missing a workout. Last day of the challenge was the day we were driving to the beach so I actually finished on Sunday. But I still finished strong! It actually felt weird while we were on vacation to not be taking the time each night to tune in and sweat (no fear – we did enough during the day between boogie boarding, walking, running, and bike riding to make up for it). By the scale I’m down about 7lbs since I started this and here’s how the inches stack up. Not a huge change from day 75 to day 90 but from 1-90 there was quite a bit. I missed my calf measurement in that table but I lost an inch there too! So, now that this is over I’m left with “now what? !” -itis. There is a 3.0 coming in the new year plus she’s re-releasing 2.0 come September. I personally have to get on the half marathon training program and will continue with a mini challenge that was posted during the lull between 1.0 and 2.0. Bottom line, I’m not stopping here. I have another 5-10lbs that I’d love to lose and this seemed to work well for me so I’m gonna keep on doing it! So I missed posting the meal plan for last week because we were at the beach. It doesn’t mean that I didn’t plan though. We went to the beach with a full menu planned – both lunch and dinner. We stuck to it for the most part (because I worked in ample “eating out” options) but did cook at home at least 1/3 of the time (and I’d say 90% of our lunches were at home). So, I only gained 3lbs while at the beach (thanks to an ample supply of margaritas and daiquiri mix). This week is a “getting back into the swing of things” week. I have not made it to the grocery store yet so the earlier meals are based on what I have in the kitchen. Hopefully I can get out to the store tomorrow. I’m also going to skip sat/sun most times since we’re out and about and have no idea what we’re doing.